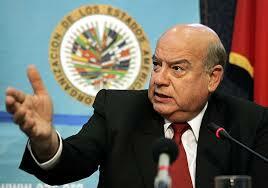 News Americas, WASHINGTON, D.C., Tues. Nov. 11, 2014: Secretary General of the Organization of American States (OAS), Jose Miguel Insulza, today urged both the governing and opposition political parties in Guyana to redouble their efforts to reach an understanding and compromise on the major political and socio-economic issues facing the country. The Secretary General comments came a day after Guyana President Donald Ramotar suspended the Tenth Parliament of Guyana with immediate effect for a maximum period of six months. Since the elections on November 2011, Guyana has had a split governance system with the executive controlled by one party and the combined opposition having the majority in Parliament. Secretary General Insulza also said he hoped that parliamentary debate could be resumed in the 10th Parliament in the shortest possible period of time.